If you need a way to carry a short barrel weapon system our Short Barrel Scabbard does the job.The Short Barrel Scabbard was built for the lever action Mare’s Leg weapons systems like the Rossi Ranch Hand, Puma 92 Bounty Hunter and short barrel shotguns. The short barrel scabbard was designed to ride vertically on the back with the ability to draw the weapon from the scabbard easily with one hand without removing the scabbard. The shoulder and waist straps are adjustable so it can be setup quickly. The short barrel scabbard can be modified with padded shoulders. Molle and velcro can be added for personal preference. Check out this custom short barrel scabbard!! This is one way to get to the office. The scabbard is available in our standard stock colors: Multicam, A-TACS AU, A-TACS FG, Coyote, Ranger Green, Khaki, OD, Woodland and Black. If something custom is need like the above scabbard send us an email. The AK47 20 round mags were designed for tank, vehicle and airborne troops. Reducing the AKs profile thus making it easier to work in confined spaces, but still giving the end user a good amount of firepower. The AMD-65 was designed specifically for paratroopers and tankers. The 20 round mag being shorter creates a smaller silhouette, but also, due to the front pistol grip,it’s a little tougher to insert 30 rounders, hence why many people with AMD-65’s continue to use the 20 round mags. The smaller mag is perfect for shooting off a bench or prone. Most 20 rounders were made by Hungaria, but other countries made them as well. There are not many pouches or chest rigs out there that support these smaller mags. So how do you carry these smaller 20rd AK47 mags? We took our standard AK47 chest rig and cut it down. The 20rd AK47 chest rig has all the same great features and options as our standard rig. 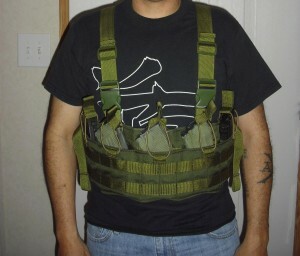 Because this rig is designed for the smaller 20 round mag there are only two rows of molle across the front of the rig. The two rows provide the molle attachment for smaller molle pouches. If you are looking for a way to lighten your AK ammo load or reduce your signature the 20rd AK chest rig is now available by request. It is available in 3mag, 4mag, 5mag, 6mag and 7mag versions and many camo and color options. Multicam, A-TACS AU, A-TACS FG, Coyote, Ranger Green, Khaki, OD, Woodland and Black. Thanks to all those that provided information about the 20 round AK47 mag.